As far as origin and history is concerned, in 1998, in a village named Nipah in Malaysia, the outbreak of Nipah virus was first witnessed with pigs as intermediaries of the transmission. The virus infected a large number of pigs and their caretakers. Thus the virus inherited its name. In Kerala, the sudden outbreak of Nipah sent a chilling wave of horror all over the nation because any proper vaccination or treatment is yet to be discovered. The number of victims rose sharply in a regular manner. The virus created an atmosphere of panic and confusion because not much is known about it. According to World Health Organization (WHO), Nipah virus belongs to the category of zoonosis. It also identifies the virus as a highly contagious one and that also with no proper treatment available. Fruit bats are considered as the natural hosts of transmission. In this article, I will discuss the potential risk of viruses like Nipah in bioterrorism. I will also consider a few more virus examples from this zoonosis category and then focus on bioterrorism. Transmission of the virus is believed to take place when someone consumes an infected fruit which is contaminated by bats. As a preliminary safety measure, one can be careful while choosing his/her fruit. Fruits with broken skins should be right away rejected for consuming. While finding the root cause of the spread of the virus, WHO considers the loss of natural habitat of the bat to plays some important role. The theory proposed by the doctors in this reflection is that the bat habitation is getting destroyed by human activity as a result of which the immune system of bats is also getting weak. The virus cannot be controlled by their immune system and a lot of it is spilling out as excretion and saliva. On the other hand, human to human transmission of the virus occurs due to direct contact. It is mostly spread through coughing and body fluid of the infected person. This is why the people connected with the hospital system like cloth cleaners and nurses have a high chance of getting affected. The symptoms of Nipah virus infection are high fever, abnormal breathing, drowsiness, headache, disorientation, nausea, sore throat, vomiting, and muscle pain. The condition worsens very quickly and it can progress to a state of coma within 48 hours if no actions are taken. The treatment is limited to supportive care only. So the medical team generally works on neutralizing the symptoms caused by the virus. As far as current medical studies are concerned, Ribavirin was tested on a group of Niipah affected but it cured a handful and was unable to cure the rest so whether it is useful or not is still unclear. It was seen that chloroquine, the anti-malarial drug has the potential to block some of the critical functions that help in the maturation of Nipah virus but clinical benefits are yet to be observed. Like Nipah, Rabies also falls under the category of zoonosis. The virus is known to infect nervous system of mammals. The virus travels through the brain nerves and reproduces and then travels back to the other parts of the body. Eventually, on its way, it reaches the salivary gland and it is released as saliva. The infected saliva leads to transmission. In general, rabies virus is transmitted from rabid animals like fox, bat, cattle, monkeys, cat, and dogs through bites. If not treated, rabies not only damages brain but also leads to death. For humans, the incubation period ranges from 2 to 8 weeks and for animals, it depends upon the particular animal, size of the bite, place of bite, severity of bite. In case of dogs, the incubation period ranges from 14 and 60 days. As a precautionary measure, anyone who is exposed to an animal bite, scratch should go for treatment without waiting for the signs of rabies to appear. Once the disease has progressed to the point where symptoms of rabies appear prominently, the virus has spread to a good extent and the patient will eventually die. Medicine and vaccination can only extend the life. A person bitten by a rabid animal experiences lack of appetite, diarrhea, tiredness, headache, cough, sore throat, fever, abdominal pain, vomiting, and nausea which is followed by a period of extreme worry, sleeplessness, depression, irritability, and fear of water. Up next, the muscles near the area of bite/scratch gradually become paralyzed and a coma develops before death takes over. It is very important to treat animals from rabies through so that the virus does not spread in a locality or a community. As far as rabies treatment is concerned, in human, rabies is treated by a combination of human rabies immune globulin and anti-rabies vaccine. If someone is bitten by an animal, he/she should wash the area continuously under tap water for at least 15 minutes. The person should also use disinfectant soap to rinse the area. Then he/she should seek medical care from a proper medical institution. Swine flu also falls under the category of zoonosis. It is a typical influenza virus which infects the respiratory tract of pigs. In general, people closely associated with pigs due to their lifestyle such as pork industry workers inherit this infection. The symptoms of the virus are reduced appetite, nasal secretion, sore throat, rash, headache, diarrhea, and cough. More or less, the symptoms are same for both humans and pigs. The virus is transmitted from human to human through ingestion of droplets containing the virus from sneezing and coughing. The incubation period of this virus for humans ranges from 4 to 7 days. The problem with swine flu is not confined to itself. It simply opens gates for other diseases such as pneumonia, seizure, and other lungs and heart problems. As far as treatment is concerned, swine flu is treated with the same antiviral agents with the help of which influenza A and influenza B are treated: Relenza and Tamiflu. On the other hand, no tests could conclude that consumption of pork leads to swine flu but experts advise to stay away from it during infection period. Just like the previous one, everything is same; the only difference is unlike pigs, birds, especially, chicken and duck are the carriers and the workers of the poultry farm are the affected ones. It is also treated with the same antiviral agents. However, in this case, doctors have warned consumption of raw or half boiled egg and chicken (unless cooked at a temperature of 165 degree Fahrenheit or 83.9 degree Celsius). Now, let us come to bioterrorism. It is an intentional release of harmful biological agents like bacteria, virus, fungi, or toxins to cause illness and death in people, animal, and plant. It may be naturally occurring or human modified. As far as cost is concerned, biological agents are relatively inexpensive and easier to obtain than warfare weapons and ammunition. However, as a military asset, it comes with a handful of limitations. The most important and core limitation is that the bio-weapon bearer country cannot get away from the negative externality that the bioweapon carries. As per history, bioterrorism was first used in World War I. Several attempts were made to use anthrax towards the animal population but it remained ineffective. During the war, Germany had launched biological sabotage campaigns against its allies: Russia, France, US, and Romania. Most of these campaigns were successful. Animal population was targeted in order to hinder troop and artillery movement and reduce convoy supply. US Department of Agriculture categorizes several bio-terrorism agents into 3 types: Category A, Category B and Category C. Category A agents require a prior public health preparedness to be countered. They are easily transmitted and disseminated. These agents pose a risk to the national security and possess the potential to result in high mortality. Some of these agents are Tularemia, Anthrax, Small Pox, and Bubonic Plaque. Category B agents are moderate in terms of transmission but they have relatively low mortality rates. No public preparedness is required to counter these agents but treatment of takes some time. Some Category B agents are Brucellosis, Q fever, Abrin, Typhus, and Viral encephalitis. Category C agents are emerging pathogens which might be engineered to spread bioterrorism. These agents are not only highly available but they also spread very quickly and has high mortality rates. Some Category C agents are Nipah, Hantavirus, SARC, and HIV. For a worldwide view, Category A and Category C agents can cause serious damage to the habitats of the earth. There is way more important internal bioterrorism in India that we citizens should fear from external bioterrorism from some other country or group of countries. 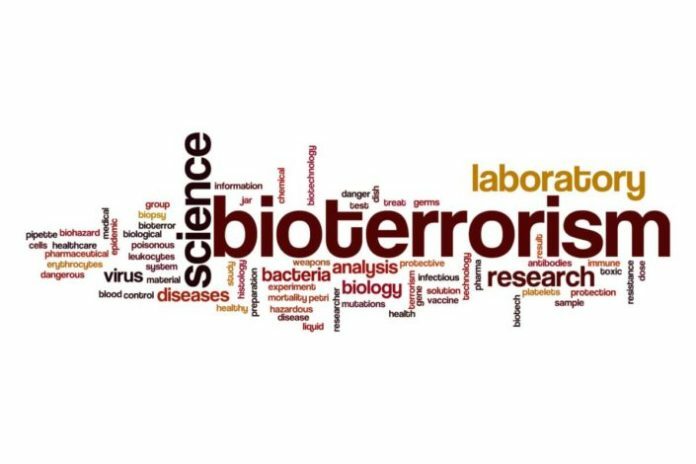 The dictionary meaning of bioterrorism is limited to external bioterrorism but for India, internal bioterrorism possesses a higher risk than that of an external one. Recently, 20 tons of carcass meat of cats and dogs were discovered in Kolkata which were allegedly packaged and kept in the cold storages. These rotten meats are distributed in renowned food junctions all over the city and some of it is even exported to neighboring countries like Nepal and Bangladesh. Furthermore, the rotten meat is beyond suspicion because of its chemical treatments. As per an investigating officer, the meat is first washed in formalin, a toxic carcinogenic chemical which is generally used to preserve dead bodies in mortuaries and then fat from it is separated to fight rotting. Then calcium propanoate is injected in the meat before keeping it in a solution of aluminum sulphate and lead sulphate to get rid of the foul smell. As per a study carried out a few years ago in Kolkata and Delhi, alarming levels of mercury in fish was reported. Chemical gels are injected in prawns and lobsters to make them look bigger and increase the weight. Fish wholesalers are also reported to use formalin. Cassia is sold in the market in the name of cinnamon. In reality, cassia is an inferior quality cheap substitute. In fact, cassia contains coumarin, a chemical by which rat poison is made. Food Safety and Standards Authority of India (FSSAI) banned chemical, calcium carbide is used to ripen fruits like banana and mango. It is somewhat an open secret that the perishable vegetables, meats and fish and dairy products (paneer, milk) which do not get sold during the day are sold off at cheaper rates and the restaurant and sweet shops are regular customers of these kinds of items. Some of the items are adulterated within the wholesale market to increase the time period of the product-cycle. So in real terms, the end-products which we are served in the open markets are adulterated once and that served in restaurants and sweet shops are adulterated at least twice. This is the real scenario of big cities of India like Delhi and Kolkata, where studies have been carried so far. This internal bioterrorism is more dangerous than the external bioterrorism. First of all, studies are still going on to find the result of this kind of food adulterations. Studies are still in the process and no exact conclusion is reached so far. Moreover, the variety of adulteration process opens ventures for a variety of infections and diseases. At least, for the external bioterrorism agents, we have some idea about the agents such as their symptoms and treatment ways. On the other hand, for the internal bioterrorism agents, we really have no idea about the agents or their possible symptoms or the treatment ways. Here the agents are unknown ones. Even if the mortality rate and transmission rate of these unknown agents are same or even lower than the so-called external counterparts, the ‘unknown’ factor makes these agents more dangerous. Neither can we categorize them nor can we counter them. It can only create a big public panic. Last, but not the least, we have to survive by eating food but if there is adulteration corruption in every type of food then we cannot just reject a typical dangerous one and be satisfied or fearless with the rest. India has a high poverty rate and it is true that our food security acts are still inferior to feed each and every citizen. As a nation, we are poor and everyone cannot earn their regular dose of bread and butter but if the quality of food served in the open market continues to be like this then this will be no less than a terror attack. As a conclusion, I would like to finish my article by finding the root cause of this type of corruption which indeed is a bioterrorism in disguise and which might create a serious problem for the mass. The one and only finding that I can think of is that of business mentality where the violator’s conscience is always undisturbed for the sake of business prosperity. It seems that unless the educated lot installs some sense of responsibility as a citizen along with some extent of morality, they will be business minded prospering themselves at the cost of the health of the nation. The essay is written by Adhiraj Sengupta ,Winner of the Essay Competition organized by Monomousumi.com, for the month of June, in above (10+2) std. students category. Adhiraj Sengupta is currently pursuing MA in Economics from Rabindra Bharati University, Kolkata. He has an appetite for writing.